Black cats are often overlooked by would-be adopters and many of them remain in our care for longer than others. This is why we have decided to support the national Black Cat Awareness Day on Thursday 27 October. We want to celebrate everything that is great about black cats, so go to our Facebook page and share your pictures of your black cats and tell us why you love them so much. Even if you don't have a black cat, then you can show us your support by spreading the word. We currently have two black cats ready to find their forever homes. Two-year-old Millie came in from a mulitcat household and after having six kittens is looking for an easy life! She's been with us a few months, so is urgently looking for a forever home. She is neutered, micro-chipped, fleaed, wormed, is vaccinated against cat flu and enteritis for 12 months and comes with four weeks free insurance. Lily came in with her sister Gracie after being dumped. She is very friendly and a real lap cat. She has been neutered, micro-chipped, fleaed, wormed, had a first vaccination against cat flu and enteritis and comes with four weeks free insurance. To find out more about all the cats we have ready for adoption, go to the Adopt a Cat page. 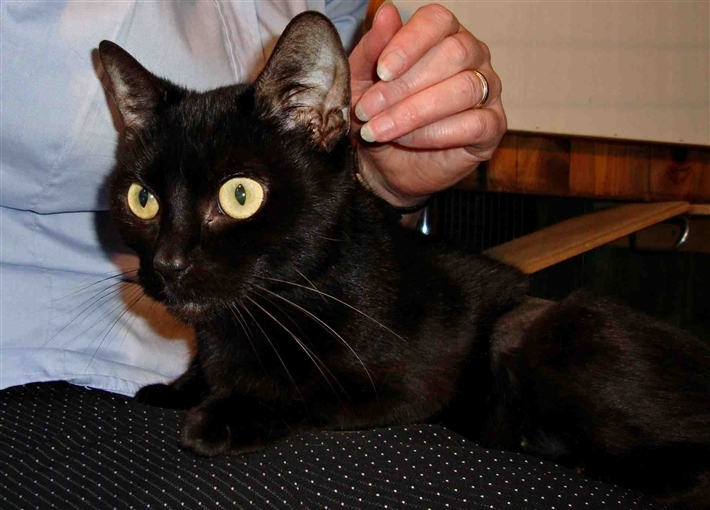 "In February 2011, I adopted a black cat from Peterborough Cats Protection. I went to one of their open days one Sunday afternoon, with no intention whatsoever of getting a cat. I already had two, and it hadn’t crossed my mind to get another, not least because I was under threat of redundancy and likely to be out of work within a few months. "There were around half a dozen cats at the open day needing homes. One of them was a beautiful long haired black female with a lovely temperament. She was affectionate and playful and she liked having her tummy rubbed. I did this and then moved on and looked at the other cats, and at other things. I found myself going back to her on a number of occasions, she was so lovely. There was just something about her that appealed to me, I can’t really say what it was. "I put her out of my mind and went home and tried to forget about her. But I couldn’t. That night I lay in bed thinking about her, wondering if she would get a nice home, what kind of person would take her and so on. I just couldn’t stop thinking about her. It was out of the question for me to have her due to my employment situation. "My company had announced a mass redundancy exercise a couple of months previously. Within my team at my grade there were six of us and only two jobs going forward, so four of us had to go. It was not looking good. The story was the same throughout all areas of the company. I had to put the black cat out of my mind. But I couldn’t. I spent most of that Sunday night lying awake thinking about her. "I went to work as usual on the Monday morning and got on with my day. The black cat kept creeping into my mind. I went home after work and decided to have an early night as I was very tired from lying awake the previous night. I got into bed and immediately started wondering about the black cat again – had she got a home yet, had anyone shown interest in her, and so on. "As I lay there wondering I realised that I didn’t want anyone else to have the black cat – I really wanted her. But there was the problem of finances and looming redundancy. I started to think about how much extra it would cost me to have her and how I could manage. Although it wasn’t a sensible idea I decided to throw caution to the wind and adopt her – if she was still available. The following morning I contacted Cats Protection - it was my lucky day – she was still available. I reserved her over the phone and arranged to have the home visit and do the paperwork over the next few days. I collected her from her fosterers the following week. "Fluffy settled in really well straight away and the other cats liked her too. A couple of weeks later I was at work and received a phone call from my boss – he told me that although I no longer had a job in the same department, I was being moved into a vacancy that had occurred in a different part of the company. So, I wasn’t going to be made redundant after all – my first thought was thank goodness I had gone ahead with the adoption. "Six months on, all three cats are happy and settled together and I am settling into my new job. It’s all worked out so well and I can’t help wondering if my little black cat brought me good luck!"